For a long time, we have thought of Antarctica as isolated from the rest of the world. The continent is entirely surrounded by the Southern Ocean, which heaves with giant waves whipped up by intense winds, and is home to the world’s strongest ocean current, the eastward-flowing Antarctic circumpolar current (ACC). The Southern Ocean is associated with several circumpolar oceanic fronts (see image below), where sharp transitions in ocean temperature and salinity occur. Approximate positions of the Antarctic polar front and the subtropical convergence, which are the northern bounds of Antarctic and sub-Antarctic water, respectively. One of the most significant of these is the Antarctic polar front, a convergence zone where cold Antarctic water sinks under warmer sub-Antarctic water. 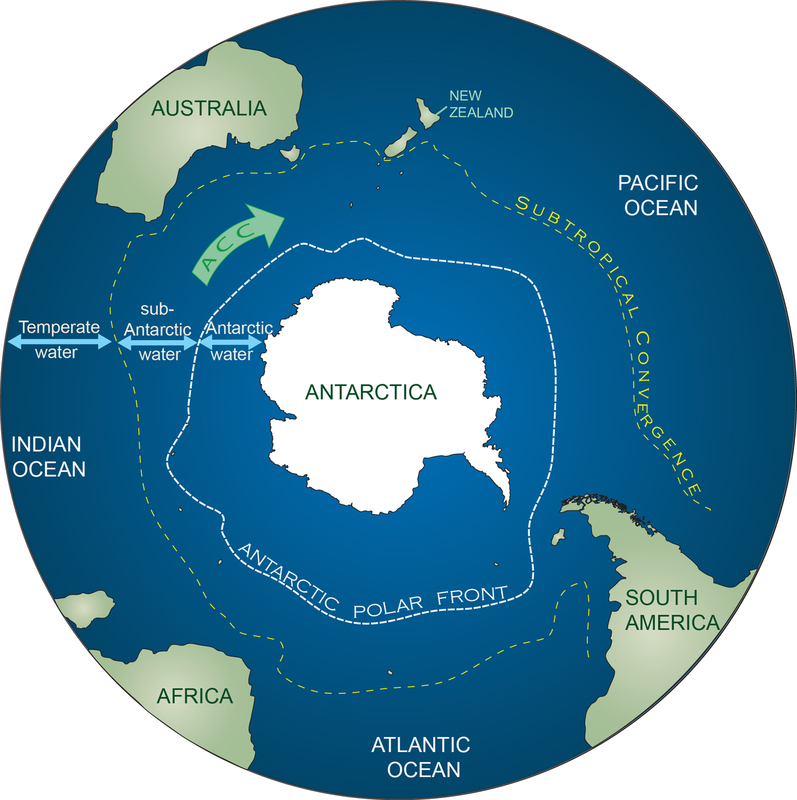 The polar front was considered as a barrier blocking movement of marine plants and animals into and out of Antarctica. Many groups of organisms show strong differences on either side of the front, suggesting northern and southern populations have been separated for a long time. We know from genetic work that some species, such as some molluscs and crustaceans, have managed to cross the front in the past, but there is little evidence that biological movement across the front can or does still occur. Some live adults and larvae of crabs that hadn’t previously been found south of the polar front have recently been detected in Antarctic waters, but there is doubt about whether these are true invaders from the north, or have been around Antarctica for thousands of years. Globally, many species are either moving up mountains or towards the poles as the Earth warms. This trend has been going on since the end of the last Ice Age, but is accelerating as global warming speeds up due to human influences. In the Northern Hemisphere, shallow waters and continental land span almost all latitudes from the tropics to the poles (see image, below), making it straightforward for many tropical and temperate species to move north. Pole-centred globes showing the oceanic isolation of Antarctica compared to the more continental Northern Hemisphere. But in the Southern Hemisphere, the Southern Ocean gets in the way of plants and animals trying to head to higher latitudes. Many species that are already on the southern tips of continents such as South America, Africa and Australia face extinction if they cannot move south as the climate warms. 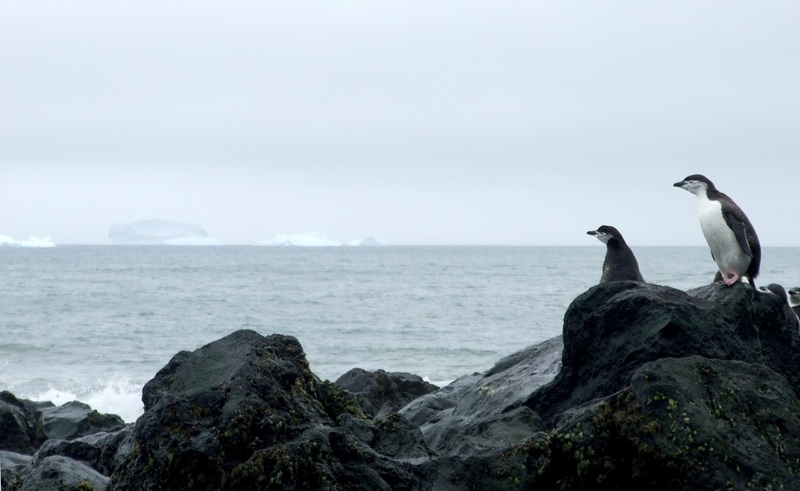 Antarctic ecosystems are unique; they feature large numbers of species not found anywhere else in the world. Many Antarctic species are slow growing. Antarctic lichens, for example, take between 100 and 1,000 years to grow one centimetre. Antarctic species have adapted to extreme conditions where evolving strategies to compete with other species has been less important than evolving ways of dealing with intense cold and desiccation. As a result, most Antarctic species are poor competitors. New arrivals could cause major ecosystem shifts and sharp declines in native species. Some such impacts have already been seen with invasive species reaching sub-Antarctic islands. To protect Antarctica’s fragile ecosystems from the impacts of invasive species, efforts are being made to limit the chance of humans (tourists and scientists) moving exotic species into the polar region. The chance of non-native species finding their own way in has generally been considered too remote to pose a major threat. Antarctic penguins watch the ocean. Modelling and oceanographic research has started to indicate that the polar front is not the unbroken, continuous barrier was thought to be. Rather, it is a dynamic, shifting series of water jets that can be breached by features such as eddies, which transport pockets of water through the convergence zone. On each of three separate ship voyages – one in the Atlantic Ocean (2013-2014), and two in the Indian Ocean (2008 and 2014) – many detached pieces of kelp species that grow in the sub-Antarctic were observed floating on both sides of, and across, the polar front. Southern bull-kelp grows abundantly in the sub-Antarctic but can drift long distances at sea. Floating kelps act as the “taxi service” of the sea, forming rafts that can transport diverse species – even entire communities – across hundreds of kilometres of open ocean. At the moment, the absence of most of these species from Antarctic shores suggests that cold and ice are stopping them from successfully colonising polar environments. Some groups, at least, seem able to disperse across the polar front and enter Antarctic waters. Antarctica has some of the fastest-warming regions of the world, and with less ice and warmer waters, many shallow-water marine species from the north could colonise and establish, irrevocably changing the structure of Antarctic marine ecosystems. The link below is to an article reporting on pollution in the Southern Ocean.